Aaaaaayyyyyyyy. 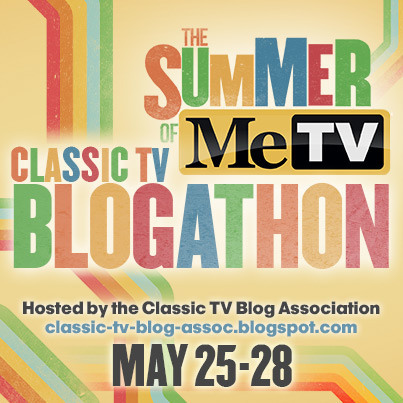 Ready for dating, drag racing, and drive-ins? Sure you are–you’re not some kind of a nerd are you? Game Box: The most striking features are neon-light-style lettering and cartoon caricatures of cast members. These caricatures are a cut above those on most games–they actually resemble their real life counterparts. Fonzie is front and center, of course, flanked by Richie and Potsie. The other Cunninghams are peeking around the jukebox. Ralph Malph is MIA. 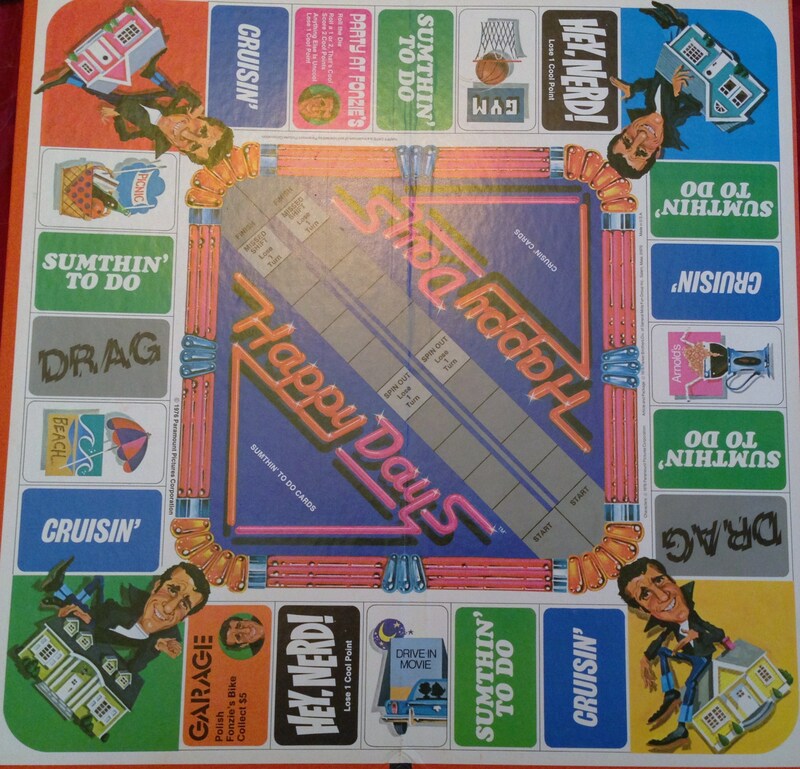 Game Board: Colorful, if not grammatical–“Sumthin’ to do?” I do wonder why Fonzie is sitting on various houses in the corner spaces. The drag strip that cuts diagonally across the board is an original touch. 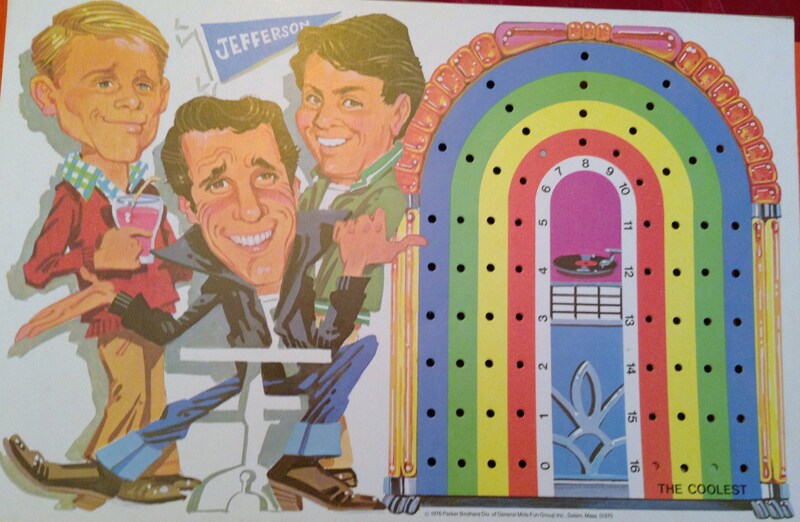 Bonus Feature: The game also includes a peg board with a rainbow-hued jukebox for tracking players’ cool points. Fonzie, Richie, and Potsie show up again here. Donny Most must have pissed off a Parker brother. Recommended Ages: 7 to 13. My Thoughts: As innocent as this game is, I can’t imagine today’s parents going for it. I mean, drag racing is pretty dangerous. There are things called “score points” that you can only receive in combination with a date card–hmm. And talk about bullying–the game itself calls kids names! 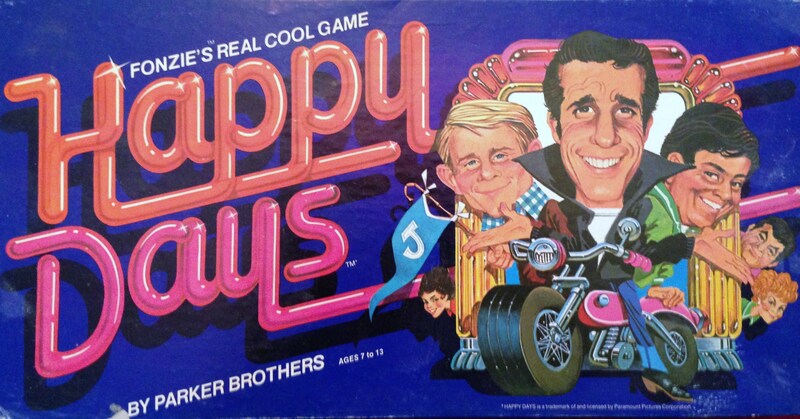 This entry was posted in Collectibles, Spin Again Sunday, Television, Toys and tagged 1970s, Board Games, Games, Happy Days, Henry Winkler, Nostalgia, Television, Toys, Vintage. LOL. 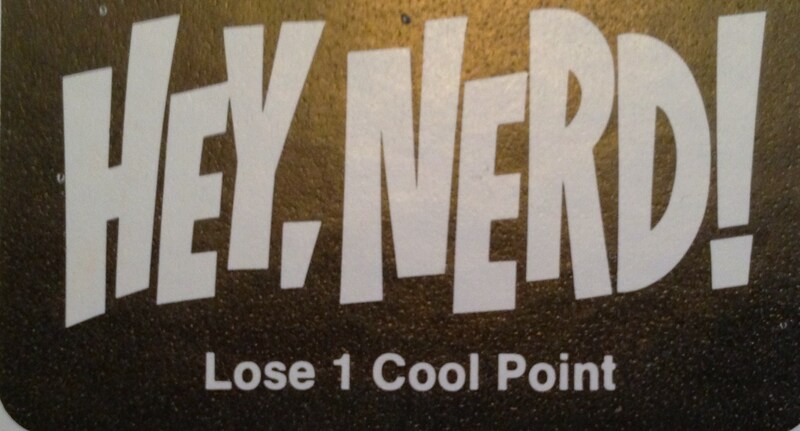 That “Hey, NERD!” graphic would make a dang cool T-Shirt! Ha! That’s a good idea.